On 30 January 1927, a violent conflict between supporters of the Republican Schutzbund and the Association of War Veterans in the Burgenland village of Schattendorf led to the deaths of two innocent people. 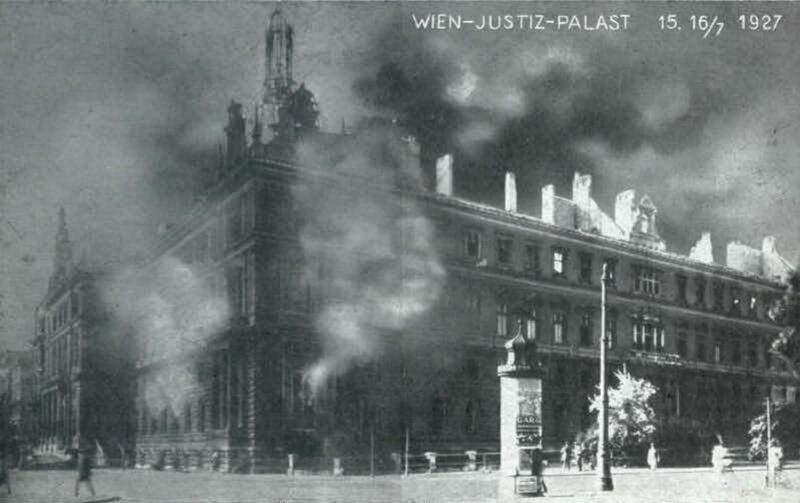 Following the acquittal of the defendants accused of the offence in a jury trial in Vienna, in the course of a violent demonstration on 15 July 1927 the Palace of Justice was set on fire. The police were ordered to shoot the protesters, and 89 people died. This terrible and tragic event is inseparably and tragically associated with the history of the Palace of Justice. It destroyed a major part of the premises, particularly the Supreme Court, together with the entire official library, at the time the third-largest law library in Europe, with its countless irreplaceable historic documents (such as the minutes of the Council of Ministers from 1867 to 1918), as well as the Land Registry for most of the districts of Vienna. Until the Palace of Justice was rebuilt at the beginning of 1930s, the judicial offices affected were provisionally housed in the building of the former Austro-Hungarian National Bank at Herrengasse 17 and Landhausgasse 4, in Vienna’s first district. On 11 July 2008, in the presence of Federal President Dr. Heinz Fischer and the Federal Minister of Justice Dr. Maria Berger, a commemorative plaque was unveiled in the Main Hall of the Palace of Justice as a lasting reminder and a warning to future generations. In retrospect, the violent events of 15 July 1927 are regarded as the precursor to the subsequent February Revolution in 1934 and the collapse of the First Republic.